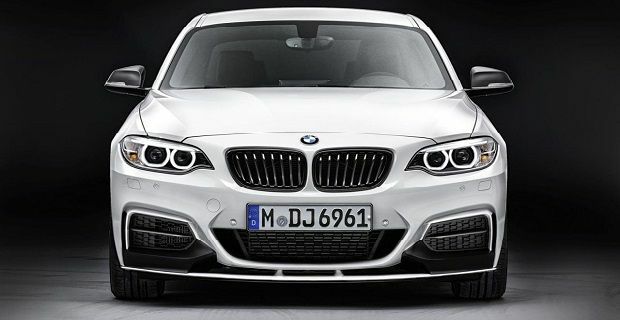 The new BMW 2 Series will be available with M Performance parts when it’s launched in March 2014. BMW are also offering a racing car version, the BMW M235i Racing, to motorsport teams for use in the VLN Endurance Championship, but there will be little in common between the road and race going 2 Series. The M Performance components will be available across the range so you can tweak a diesel or petrol version of the coupe. Engine, aero and suspension modifications will boost performance, and BMW are promising that these enhancements won’t ruin fuel economy or change the emissions figures. The suspension can be lowered by 20mm and stiffened for improved handling. You can opt for 19-inch alloys, which are available in two designs, and there are new lightweight brake discs and painted callipers in the M Performance range. If you go for the top of the range M235i you can get a sports exhaust package that boost performance and makes a nice engine note. Visually the M Performance body kit really makes a statement, especially thanks to the carbon fibre rear spoiler, rear diffuser and aggressive front bumper. You can get the BMW kidney grille finished in carbon fibre and accent stripes are also available if you want to further personalise the 2 Series. The interior has a little more carbon fibre and there’s Alcantara on the steering wheel, which also has a race-style display that lights up when the revs are right for the next gear. If you opt for the 220d 2 Series, you can also have the M Performance Power Kit which gives an additional 16bhp and 40Nm more torque. All of these upgrades will be made available from March 2014, but don’t ask us how much they’ll cost as BMW hasn’t announced prices yet.